Sunday, February 1, 2009: Derry, New Hampshire – HomeAdditionPlus.com announced today its latest product in its home improvement Ebook series, the “Installing Crown Molding Ebook“. The “Installing Crown molding Ebook” is the perfect instructional guide for the do-it-yourself homeowner who wants to quickly learn how to properly install crown molding and save a fortune on finish carpentry costs. Though crown molding installation is not an art, it does require some upfront knowledge and practice so that expensive crown molding stock material is not quickly turned into scrap lumber. The Installing Crown Molding Ebook provides detailed instructions on every step in the process of installing crown molding and includes 28 instructional pictures. Authored by a master craftsman, the Installing Crown Molding Ebook provides in-depth explanations and tips on how to properly measure and select crown molding stock, so that the DIY homeowner achieves a quality finished crown molding project. It also unveils the secrets on how to cut crown molding properly. Unlike cutting baseboard trim, and door and window molding, cutting crown molding requires unique techniques to ensure it is cut correctly and material is not wasted. It provides detailed instructions how to make perfect mitered, coped and scarfed crown molding joints, and as with every section of the Ebook, detailed instructional pictures accompany the paragraphs to aid in quickly understanding how to make tight crown molding joints. 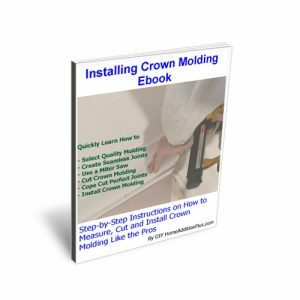 The Installing Crown Molding Ebook is priced at $19 and can be purchased online at Installing Crown Molding Ebook and is immediately downloadable.